We’ve had a lot of war-history in the recent past – 1st world war, Gallipoli, 1916 – but James (second reading James 3:16 – 4:3) talks of another battlefield…. wars of good and evil within ourselves. Co nflicting desires. In every war there is the evil fighting in the souls of the generals. Same with ourselves — good things emerge to be done and we allow other less good take over – visit someone sick but there is a match; help a neighbour but there’s a party; visit the parents and something else happens ….go to Mass and the sun comes out and we go to the beach. Desires to control people, greed, sexual exploitation of young and not so young, the internet …we know more from our own experience. Big time greed could have started with a fight over ice-cream at home, and somebody always getting their way at the expense of others. Jesus’ love and saving love can help us bring out the best in ourselves. His cross is our peace – within ourselves and within nations. This is the reconciliation Jesus promises from the cross…peace within us and peace among us. The apostles got into a row who is the best, the greatest. They want to follow Jesus but something else takes over. 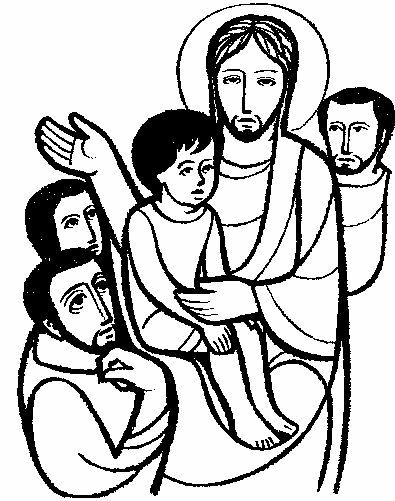 So Jesus said little but went to the children, and we see a peaceful scene. He is contrasting the two ways of life – competitiveness and dependency; just when you are getting into the competitiveness, look at the best in children. Can we bring into ourselves the best of the child and find God? – the Father whom we trust, being happy to rest in the regard he has for us, with no need to worry about who is the greatest! This entry was posted in Gospel of Mark, Gospel Reflection, Liturgy Resources, Prayer Resources, Scripture, Year B and tagged 25th Sunday Ordinary Time Year B, Capernaum, child, child of God, competitiveness, cross, desires, disciples, Donal Neary SJ, God the Father, Gospel Reflection, Gospel Reflection for 20th September 2015, humility, James 3:16 – 4:3), jealousy, Jesus, Jesus Christ, Love, Mark 9: 30-37, Peace, September 20th 2015, Son of Man, Sunday Gospel Reading and Reflection.